"Great site! Exactly (and more) of what I was looking for when I ventured onto the Web looking for information on wood stoves and wood heat in general. Well designed site also." All wood, regardless of species, has about the same energy content per pound. The different species vary mainly in density. Traditionally, the favored trees in central North America were oak and maple because they are very dense and produce long-lasting coals. But these are valuable trees and in many areas are not plentiful enough to burn. No problem, just use softer woods like birch or poplar (aspen) or any other tree that is readily available. By far the most important characteristic of any firewood is its moisture content. Keep in mind that people living in the coldest areas of North America have no hardwoods to burn and they get along just fine - their main firewood species are spruce and aspen. Ultimately, it is more important to have wood that is cut and split to the right size and properly dried than it is to get the hardest wood available. It's been said that a long straight row of firewood standing in the yard in springtime is like money in the bank. It is indeed. As it dries in the summer sunshine, you're collecting interest. Firewood with a moisture content higher than twenty percent will burn, but it will be hard to light and keep burning and will make a lot of smoke. Plus, much of its energy content will be wasted right up the chimney. Firewood should be between 15 and 20 percent moisture to burn properly, and to get that dry it must be split and stacked in the open for at least a full summer. 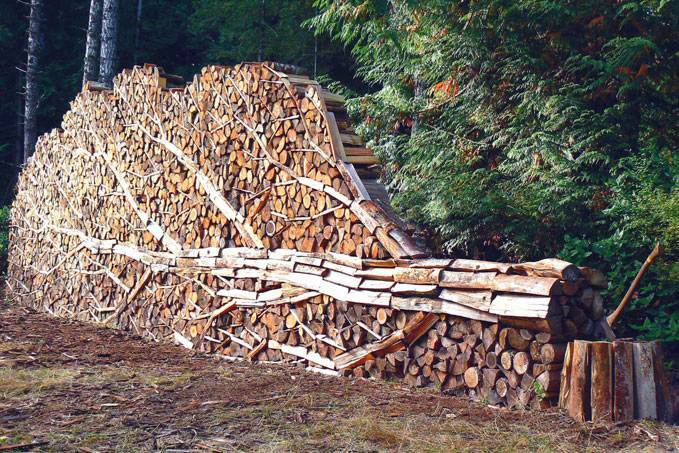 Firewood pile OCD (obsessive compulsive disorder): once the wood pile has achieved a steady state and is well stocked, the tendency of the caretaker to obsessively view, think about, brag on, and tend the "work of art". Lots of people have been mislead by old timers who say that white ash (for example) can be burned green. Sure it will burn, but very badly because it has a natural moisture content of over 30 percent. While that is lower than most species, it is still much too wet for efficient burning. Some advice from old timers is helpful, but not in this case. What is the best tree species for firewood? While there is always room for debate, we like to suggest that the best species in your area is the one that is most plentiful, easy to split and doesn't cover your hands and clothes with sticky sap. 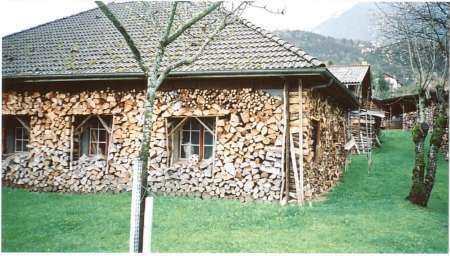 There are lots of resources here to help you to buy, process and store firewood successfully. Energy content per air dried full cord, in 000s of BTUs. The hardest species are at the top of the list. This is a house in Annecy, France. Although it looks like a firewood house, it is actually a stone house with its generous roof overhang used as a convenient and effective place to store firewood. The picture was taken by our friend Tex McLeod, on a trip to Europe.